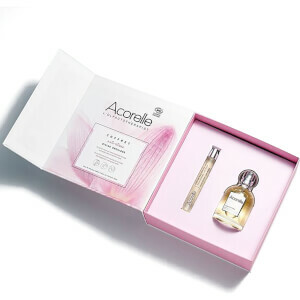 Discover the Pure Patchouli Eau de Parfum from Acorelle; an organic and natural beauty brand originating from the South of France. Expertly blended with essential oils to promote a sense of well-being, the warm, oriental fragrance combines notes of Myrrh and Labdanum with earthy Clary Sage and base accords of Patchouli, Amber and Vetiver. The perfume helps to encourage optimism and self-confidence, whilst awakening the mind and body. Heart Notes: Opoponax, Clary Sage. Base Notes: Patchouli, Vanilla, Amber, Vetivert. Vaporize a Eau de Parfum da Acorelle sempre que desejar, em qualquer altura, para usufruir dos efeitos dos óleos essenciais ativos que atuam de acordo com os seus sentimentos.